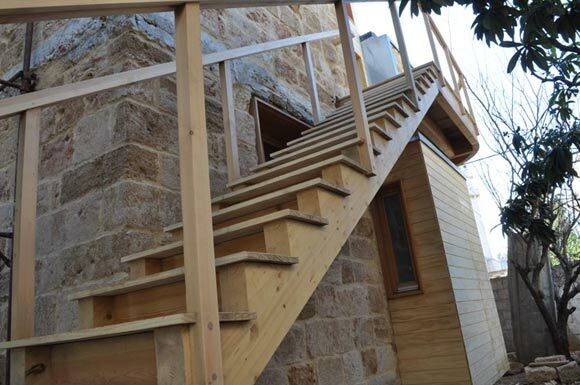 The Casa Batroun project consists in the renovation and extension of an old 100m2 family house, in the Mediterranean sea-side town of Batroun, North of Lebanon. 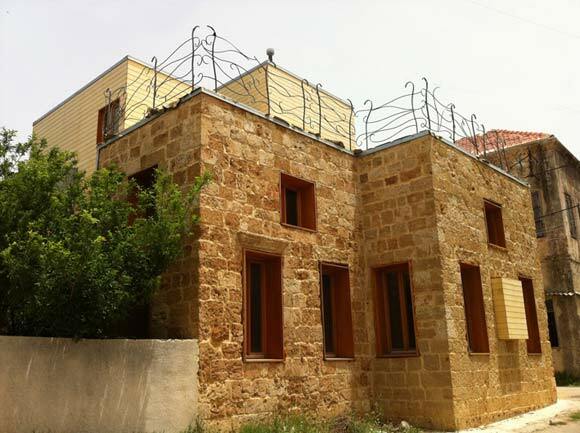 The objective was to double the existing surface area in an exemplary eco-friendly way, demonstrating that this is a possibility in a country where the tendency has unfortunately been –with the lack of proper regulation-- to destroy the old heritage and replace beautiful classified houses with characterless concrete high-rise buildings. We wanted to preserve the initial house legacy (built in the 1930s) and take advantage of its bio-climatic features such as its high ceilings and original opposite elongated windows favoring air circulation and cross-ventilation. 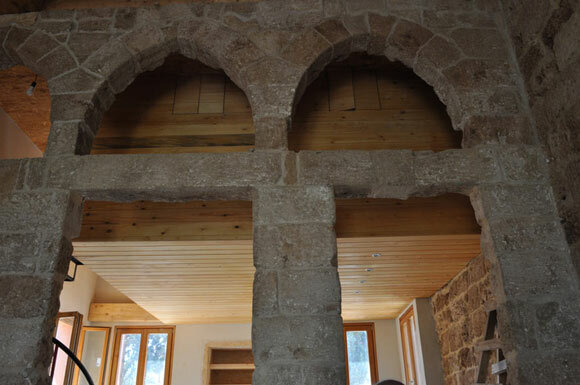 This was even more so important after the discovery that the house was actually built with local sandstone (the apparent concrete was only a cement plaster) and had the internal triple arcade, characteristic of Lebanese traditional houses (the arcade was also plastered and painted, hiding the original structure)... 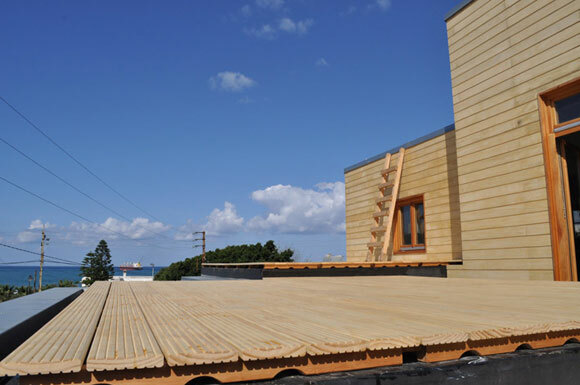 The client’s request also included the usage of natural and breathable materials, promoting low-embodied energy as well as healthy materials and finishes. The exposed sandstone walls proved to be inadequate to support another level, thus a new structurally independent wooden structure, composed of 4 vertical boxes, was inserted vertically into the original house, creating a play of levels from ground floor to mezzanine to first floor, while doubling the floor area. The design was further enhanced by carefully adopting bio-climatic features to facilitate cross-ventilation, reduce summer overheating, and limit the need for winter heating. 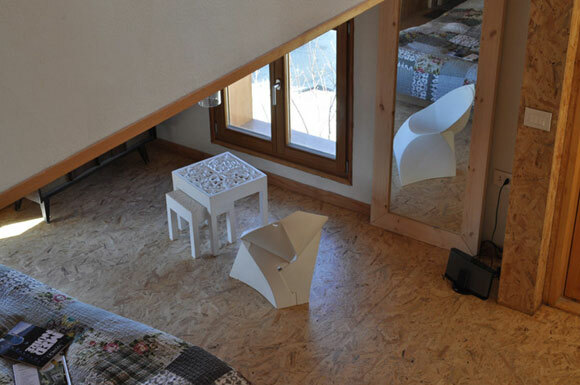 One important aspect of the house, which the architect was able to convey very well, is its compactness and extremely smart usage of space, especially in the 50m2 one-bedroom upper flat whereby, for example, the internal staircase also acts as side drawers usable in the bedroom. In a country where the average flat exceeds 200m2 and can easily reach 500-1,000m2 in private villas, the idea was to demonstrate that comfort and well-being do not have to be interlinked with size, luxury, and automated systems, and to help breaking the common belief that those elements do not constitute the “dream house”. 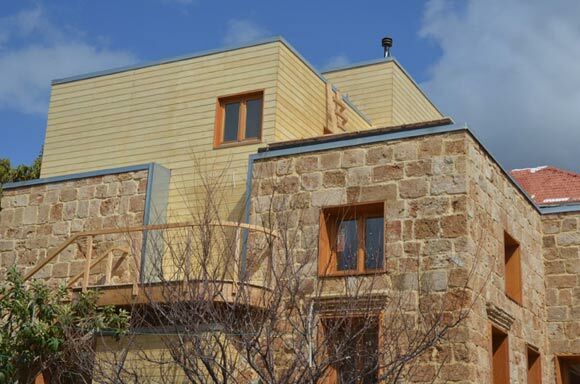 The house is probably one of the first in Lebanon to be built combining old sandstone and timber, while adopting almost exclusively natural, low-toxicity, and breathable materials. The following are some of its main eco-features: Bio-climatic design enhancing cross-ventilation and eliminating the need for cooling systems; energy-efficiency through carefully studied window positioning, shading devices, natural insulation, LED zoning of lighting, Solar Water Heating and wood pellet stoves. Water savings are realized via rainwater harvesting and low-water fixtures, while a vegetated green roof with native plants was implemented. The building of the house favored collaboration with local artisans and workers, using traditional techniques such as old oriental ceramic tiling (salvaged from demolished houses), earth-lime plastering, or artistic steel works for the terrace balustrade. Some of those techniques will soon be forgotten given the excessive reliance on hasty concrete buildings, and one of the project’s objectives was to showcase that beautiful modern houses can still adopt traditional techniques and elegantly blend the new with the old. One of the key innovative features of the house was the use of earth plaster for all the walls, made with local clay. 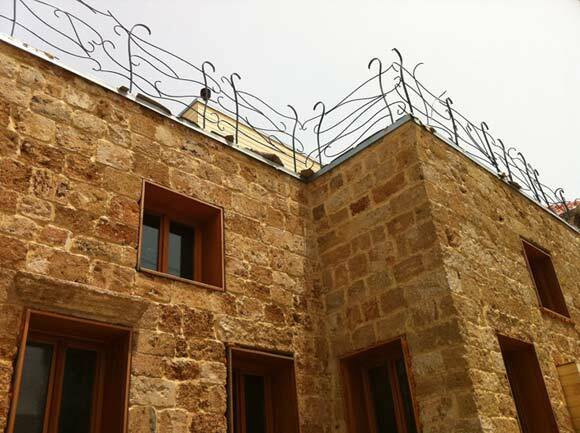 Starting from the traditional mud plaster used in old Lebanese rural houses, the architect tested several formulas combining different proportions of local clay, sand, lime and straw, in order to obtain a plaster that has the required thermal mass and does not crumble easily. The final formula includes two layers of clay plaster merged together with a fiber mesh and finished with a third layer of white lime plastering. Additionally, insulating the house was done with natural breathable materials which are not commonly used in the country, while synthetic cheaper insulation is typically the norm (if any insulation at all…). 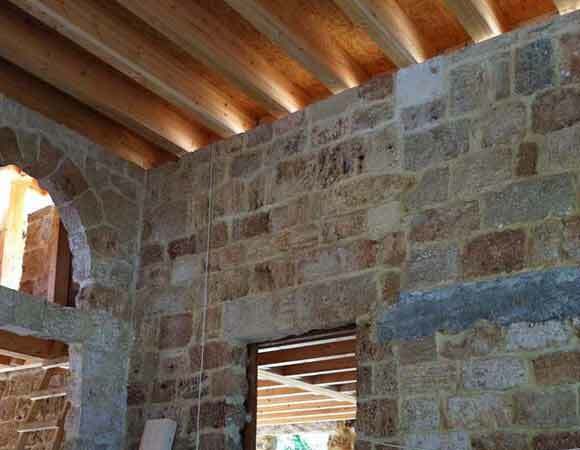 A combination of sheep wool and rigid wood fiber was used for the roofs, while the walls were insulated with loose and dense wood-fiber insulating boards. Furthermore, handmade salvaged refurbished furniture and decorative items were preferred. The owner’s family, friends, design team, and workers were invited to tile painting parties to emphasize the social context… that building can be fun and partially handmade! Earth plastering workshops were organized with the architect and sustainability team to learn about those forgotten materials. Additionally, sealants, adhesives, wood varnish, and paint were all careful selected with no or very low VOC (Volatile Organic Compounds) levels, beneficial from a health & well-being perspective by improving the indoor air quality of houses and reduce the risks of condensation, mould growth, and associated diseases. 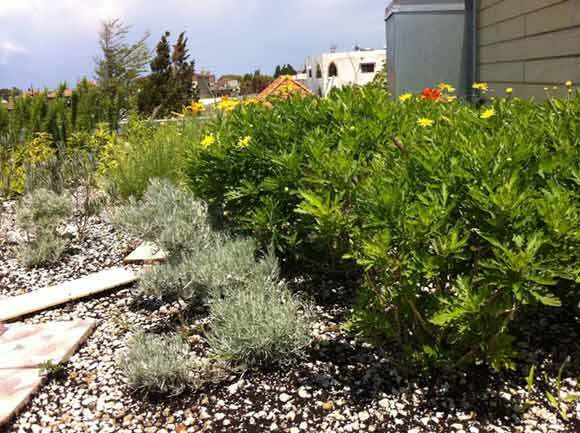 Another innovative aspect of the project is the installation of a semi-extensive green roof on one of its roofs, which was planted by carefully selecting native-only flowers and small trees to limit water usage for irrigation.